(Volume I) Composed by George Frideric Handel (1685-1759), edited by Sergius Kagen. 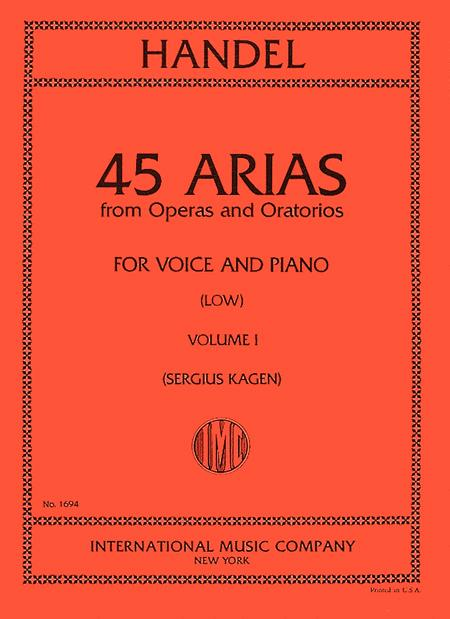 Collection for low voice and piano accompaniment. 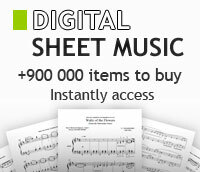 With vocal melody, lyrics, piano accompaniment, translations and introductory text. Text language Italian and English. 63 pages. Published by International Music Co.
Ch'io mai vi possa (Siroe). Come and trip it (L'Allegro). Puribondo spira il vento (Partenope). Generoso chi sol brama (Scipone). Recit: I rage, I melt. Aria O ruddier than the cherry (Acis Galatea). See the raging flames (Jephta). Violin 1 Part. By George Frideric Handel. (Violin). Choral Large Works. Size 9x12 inches. 44 pages. Published by Schirmer. (Volume III - Low Voice) Composed by George Frideric Handel (1685-1759). Songbook for voice and piano. Text language Italian and English. Published by International Music Co.
(Low Voice - Volume II) Composed by George Frideric Handel (1685-1759). Songbook for voice and piano. Text language Italian and English. Published by International Music Co.
(Volume III - High Voice) Composed by George Frideric Handel (1685-1759). Songbook for voice and piano. Text language Italian and English. Published by International Music Co.
By Wolfgang Amadeus Mozart, George Frideric Handel. Soprano, trumpet. Level: Moderately difficult. Vocal. Published by Roger Dean.